Just seventeen years old, Henry IX, known as William, is a king bound by the restraints of the regency yet anxious to prove himself. With the French threatening battle and the Catholics sowing the seeds of rebellion at home, William trusts only three people: his older sister Elizabeth; his best friend and loyal counselor, Dominic; and Minuette, a young orphan raised as a royal ward by William's mother, Anne Boleyn. Against a tide of secrets, betrayal, and murder, William finds himself fighting for the very soul of his kingdom. Then, when he and Dominic both fall in love with Minuette, romantic obsession looms over a new generation of Tudors. One among them will pay the price for a king's desire, as a shocking twist of fate changes England's fortunes forever. I wasn't even sure I wanted to read this book. As a history buff with a degree in Medieval History, I have a thing for historical accuracy. So, a book that is based on something that did not happen is treading on dangerous territory for me. This book departs from reality on January 26, 1536. On that date, Anne Boleyn miscarried a son and her life went decidedly downhill from that point on. 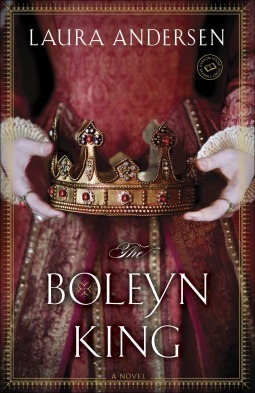 The basis of The Boleyn King is that Anne Boleyn did not miscarry and, instead, gave birth to a healthy baby boy in June of 1536--a boy who succeeds his father, Henry VIII, and becomes king. I was intrigued by this book because the Tudor period has always interested me. I've always been sympathetic to Anne Boleyn--well, I've always been sympathetic to all the wives of Henry VIII. Let's face it--they all had the rotten end of the deal. Anne Boleyn, however, has always been the most interesting of the six wives for me. So, the idea of what if she had lived pulled me in. I think the one thing that helped me deal with the fact that this is an Alternate History book is that this is a lighter read. I don't mean that it is badly written, but it is a different class than, say, a Hilary Mantel book. Andersen actually has a very readable and even style and the plot kept me intrigued. I will say that the most interesting characters for me were Elizabeth and Anne Boleyn--the two who actually existed. The 3 main fictional characters--William, Dominic, and Minuette--were fine, but all teetered too close to being cliche. While the events of this book were not historical, the setting and details were. Andersen did her research and nothing jumped out to me as being just wrong. The plot kept me interested, although some of the finer details sometimes got lost. For example, the book starts with Alyce de Clare, a lady in waiting to Anne Boleyn, dying mysteriously. Somewhere in the middle of the book, Alyce falls out of the story. When she is mentioned again at the end of the book, it was rather jarring. This book is the first in a trilogy and ends as such--in other words, don't expect a clean ending. While the book wasn't perfect, I found it entertaining to add the next book, The Boleyn Deceit (due to be published this fall), on my to-be-read list. I was not solicited for this review and I received no compensation. All opinions are mine and mine alone. I don't know a ton about the Tudor period, but it is always so fascinating to me. The Tudor period does fascinate me although I havent read a book about it yet. I do love historical fiction, but surprisingly I haven't read about this period before. I should consider doing so!